Tram workers could be balloted for strike action over shift changes, union officials have confirmed. Unite said its members were "deeply unhappy" about proposals to make rota changes and it would be meeting shop stewards to plan their next step. Tram officials said the proposed changes would affect some drivers. Extra tram demand is anticipated with the Edinburgh Gateway station opening, expansion at Edinburgh Airport and the introduction of Sunday parking charges. 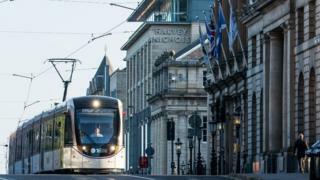 Unite deputy Scottish secretary Mary Alexander said: "Our members are deeply unhappy about the changes in rota that Edinburgh Trams are trying to force on them. "We will be meeting with our shop stewards later this week and discussing how to take this matter forward. "If the management of Edinburgh Trams don't start listening to our members' concerns, we may be left with no option but to carry out a consultative ballot for industrial action." An Edinburgh Trams spokesman said: "The proposed changes, which we're still consulting on, are about fixing a historical anomaly in shift patterns that affects some of our drivers, as well as helping the service to grow. "An expanded tram operation is good news for all of our staff and for the people of Edinburgh. "We are not aware of any proposed industrial action and have no evidence that there is any support for this among staff."